Home → Blog → Architecture in Arkansas? Of stone, wood and glass Thorncrown Chapel stands in the woods outside of the village of Eureka Springs, Arkansas. Architect E. Fay Jones received the gold medal award from the AIA for this dynamic structure in 1990. The building ranks fourth on the AIA’s list of most important buildings in the twentieth century in America. It is one of my favorites because of its simple elegance, purpose, timelessness and story. I was fortunate to sit in the chapel in the summer of 1995. It was one of my stops on a road trip across the United States visiting special places. The story of the chapel is intriguing. The owner of property, Jim Reed, decided to forgo building his retirement home and build a chapel because people regularly stopped and used his land as a resting place and to view the Ozark Mountains. In 1979 he hired Fay Jones and together they set out to create a tranquil, non-denominational chapel for introspection. Thorncrown Chapel is designed from three primary materials: native stone, dimensional lumber and glass. The site was to be minimally disrupted and all structural elements were designed so they could be carried in by no more than two people. Larger structural elements were built on site. The construction techniques used and treatment of the site was very Green. Contemporary practioners could learn a lot by studying this project. 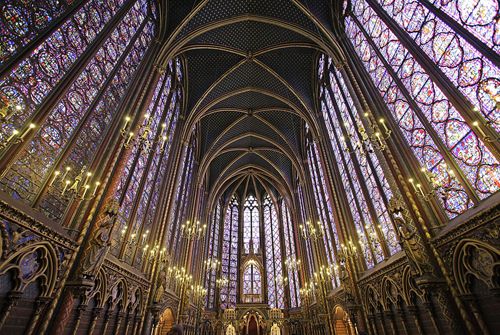 It is obvious the design of the chapel was inspired by gothic cathedrals. Fay Jones masterfully reinterprets the Gothic form- tall, long and slender and makes it truly American and of the twentieth century. Simultaneously, he bridges the past with his own era. He accomplishes this by incorporating vernacular construction techniques with the light, airy, spatial and structural attributes of the Gothic Cathedrals. He doesn’t incorporate groin vaults, a well-known innovation used by the gothic builders, but his roof trusses are reflective of them. 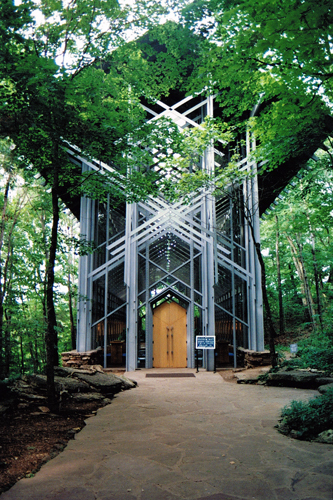 Thorncrown Chapel became the foundation for architectural style that is truly regional and connected to the history of architecture. 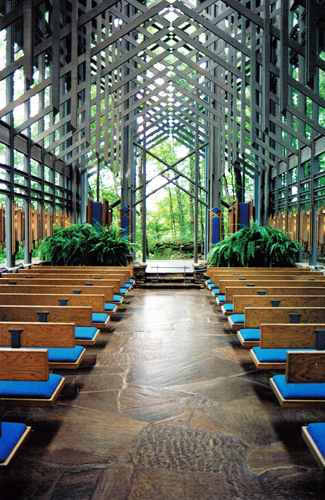 Fay Jones expanded this style in his future work, designing chapels, and pavilions. Fay Jones is one of my favorite architects. I regret never meeting him and now I never will because he died in 2004. I have read many articles and a few books about him. I find his architectural work and quotes to be very spiritual. 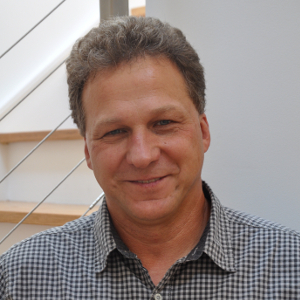 He is in a lineage of American Organic Architects. He studied briefly with Frank Lloyd Wright. He held true to the belief of designing buildings in harmony with their sites.